Well it’s getting a bit close to Christmas now and I am far from being ready! Ok so the Christmas Decorations are up, but I haven’t wrapped a single pressie!…and to think I started buying presents in September…you can imagine how many there are now! 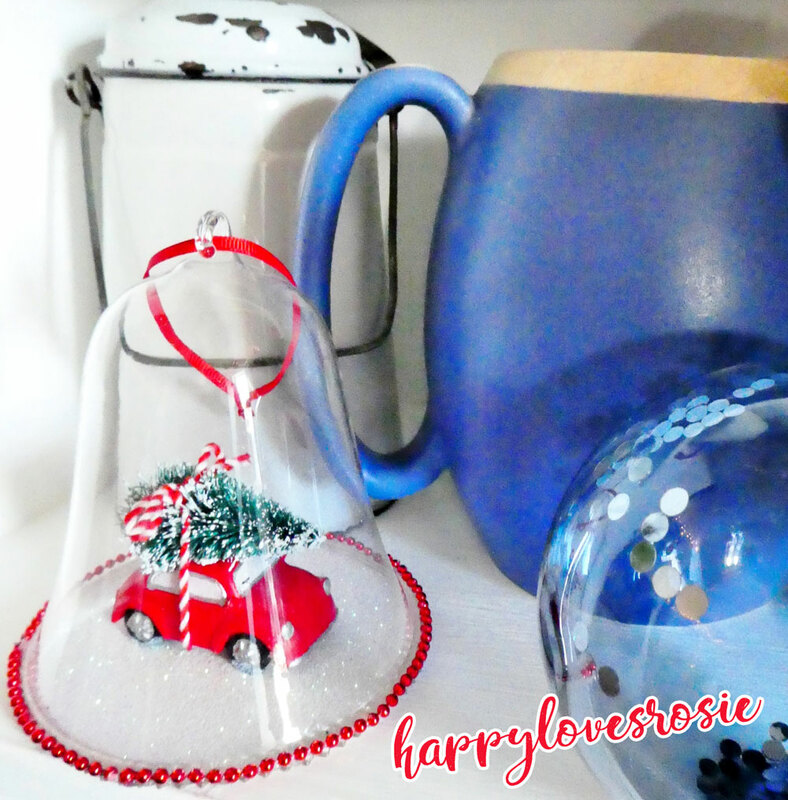 I started buying them then, because I wanted to be prepared!…I keep joking that I will probably be wrapping them all up on Christmas Eve…but I actually now think, I might be, EeK! I used to love wrapping presents as a girl, but now as an adult and with so many other things to do…I can’t think of anything more boring!…and where did all the time go! One minute it was September! and now suddenly it is 17th December!!!! 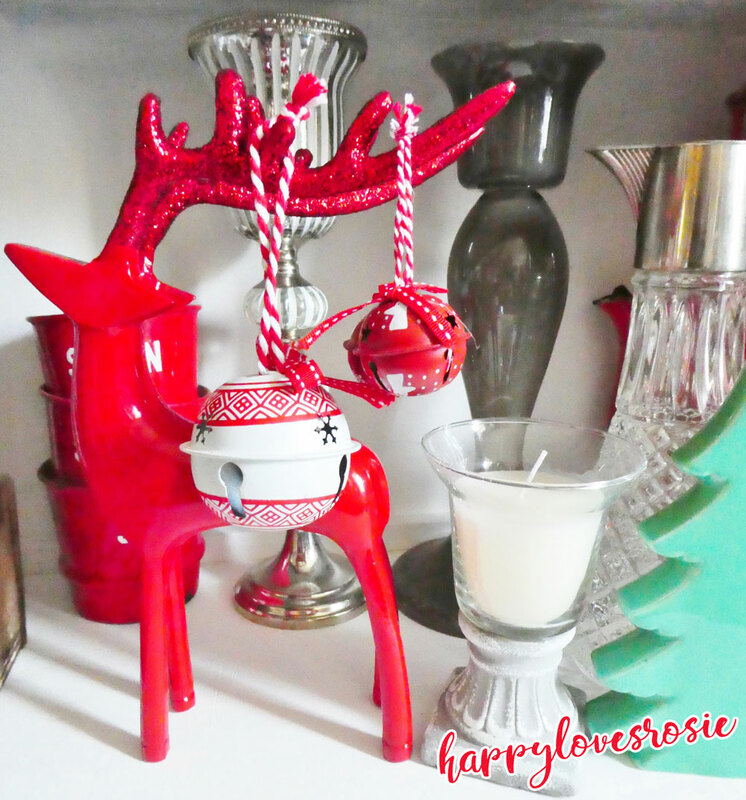 I have taken a few more pictures from my Living room, to show you all my bits and bobs and Chrimbo decs..I hope you like them…. 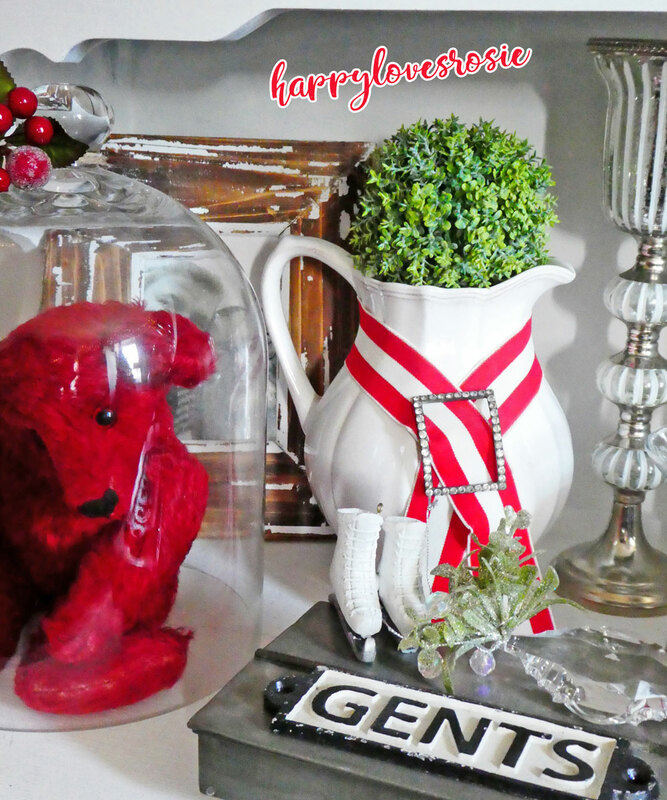 The picture above shows different items we have collected over the years…The red teddy we bought at a Bootsale about 20 years ago…Freddy gave £18 for it and he was followed across the field by a dealer who wanted to buy it there and then off of him for £50!…we had him valued a few years afterwards and they said he was worth £300…I am not sure what he is worth now, but he is one of the things, I feel, I just couldn’t part with. 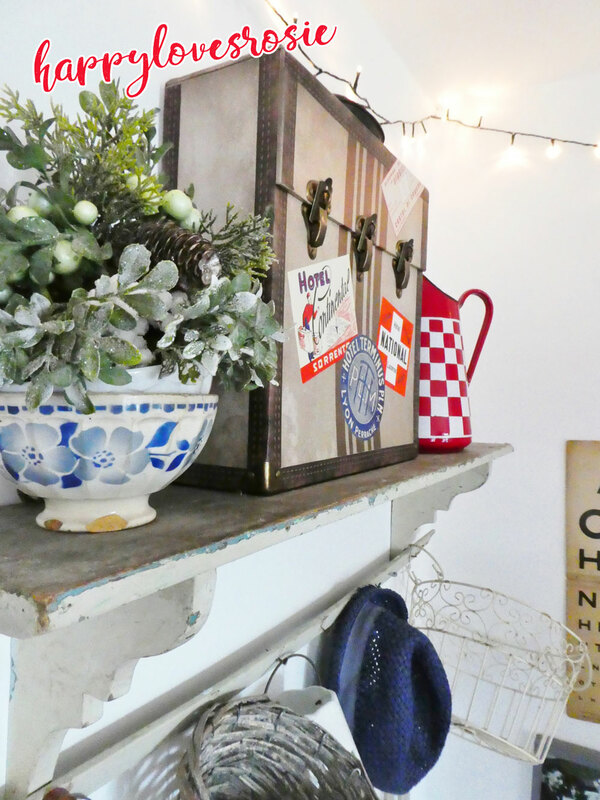 That’s the thing about Bootsales, Flea Markets and Vintage Fairs…you just never know what you will find…and adding them together with all your other belongings sure does make for an interesting display! 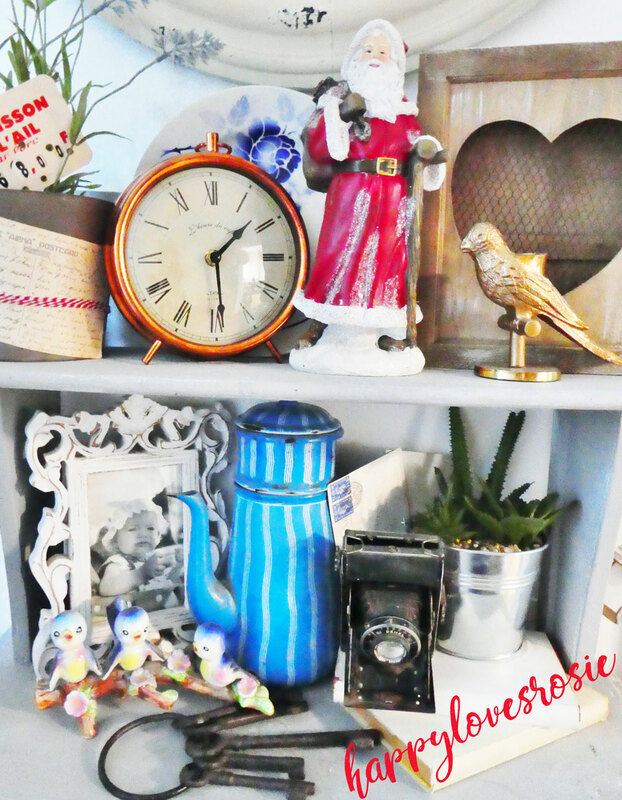 These bits and pieces have been placed on our large dresser in the Living room…when we first acquired it (the dresser! )…it was painted a dark grey almost black colour…and we lived with it for a few months…but I kept looking at it!, and looking at it! and decided it just wasn’t the colour for me! Fred said he liked it! but I just couldn’t get used to it! until one day we both decided that the dark colour had to go and we painted it white!…I know dark grey and blues are very vogue at the moment…but I like white and I will always like white…I have always said that for me! 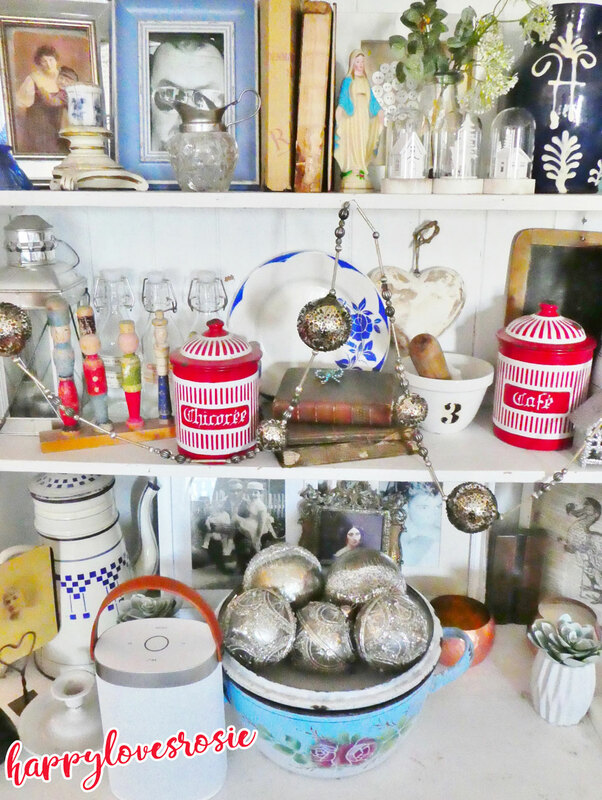 it’s like a canvas and as I have so many ornaments; I like the way they shine, when placed against a white background! We decided to buy ‘warm white’ lights this year, as in previous years, we bought ‘blue white’ lights and they just made my eyes sore…not sure why? 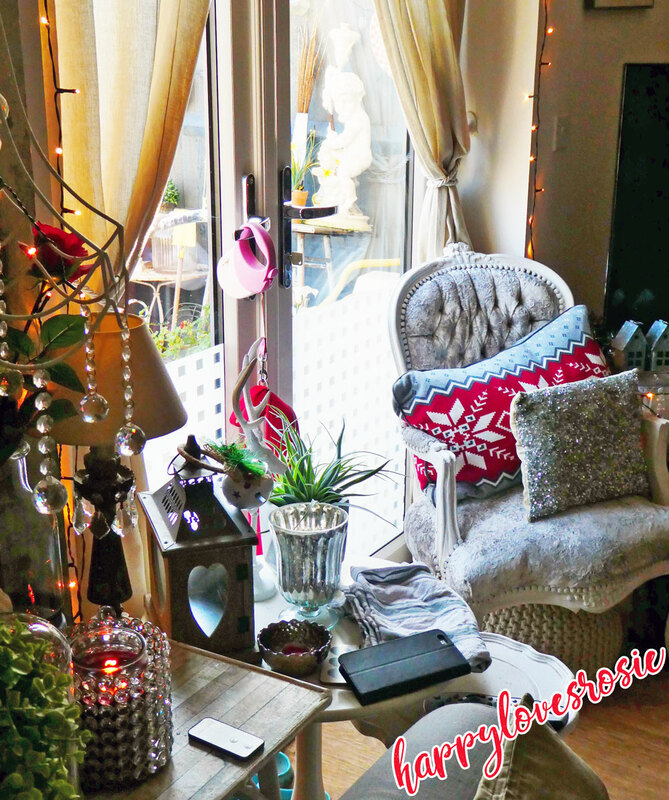 perhaps its just me, as I am a little sensitive to light…but the different colours can sure make a difference to the room…and I love the warm light look…it reminds me of being young! 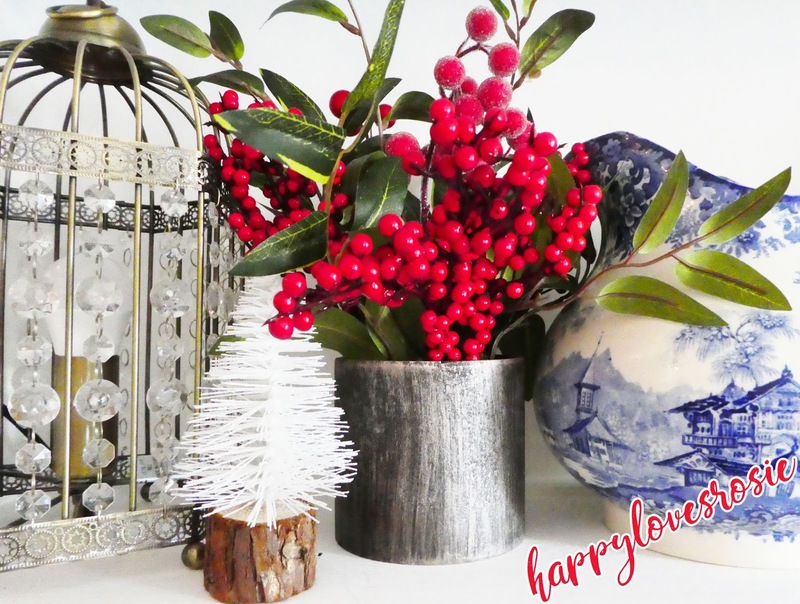 Another thing that we are really ‘in to’ at the moment is…Artificial plants…Now you all know how I have always loved artificial flowers…well this is a leap forwards…I am now loving the more leafy varieties! and we are calling them ‘Faux Botanicals’ it just sounds so much better…don’t you think? so remember whe you are out! No more ‘Artificial Plants’…but ‘Faux Botanicals’! 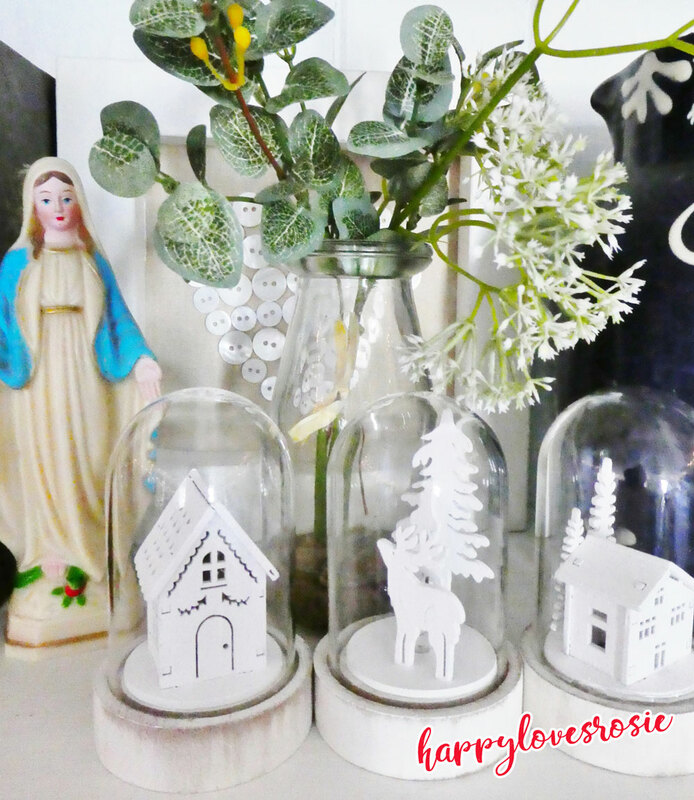 I hope that you have enjoyed my second instalment of ‘The Happy House Christmas’ Pictures and my ramblings…Gosh I do go on sometimes don’t I!…Sorry but I always feel responsible for silences and I am always nattering even when everyone else has fallen asleep in boredom! Do please let me know how your week is going? Are you prepared for the big Day? Do you like to do everything last minute? I did enjoy this installment very much, you do color so well!!!! That teddy is so cute, I haven't saw red before in that make,, the dealer was looking to rip you off, offering fifty!!! You did get a great deal didn't you,, I like the white lights too, and artificial plants have come so far now that its hard to tell from live plants , I haven't wrapped gifts yet and I still have lots to do so you're not alone lol,, we'll both get there in the end, if not oh well, what get done gets done, Looking at all your collections and your treasures make my day! I am not prepared. 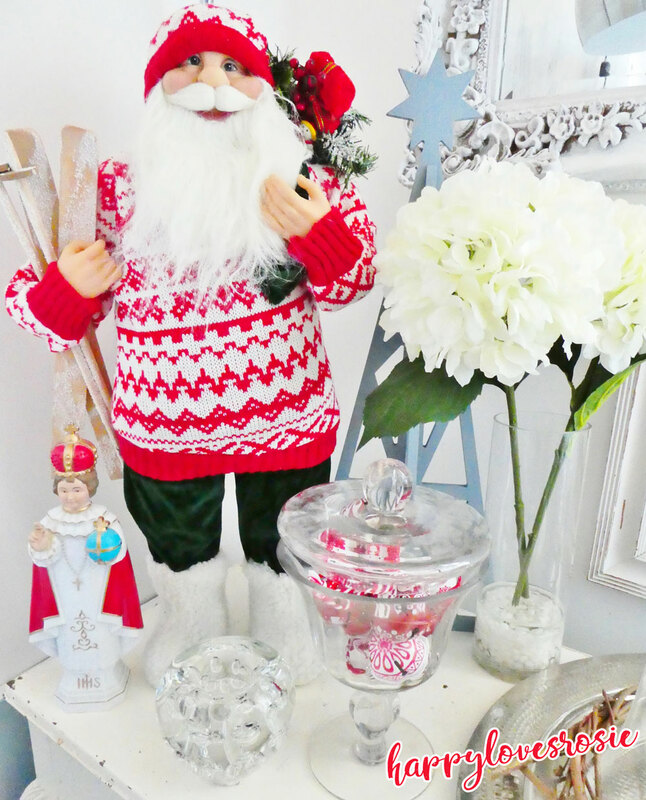 I don't know why but as I wrote yesterday in my blog, I just can't find the holiday spirit. I know Christmas is a week away but I am just not into it this year. I never mailed cards, baked cookies, etc. I don't have things wrapped or even the shopping finished.